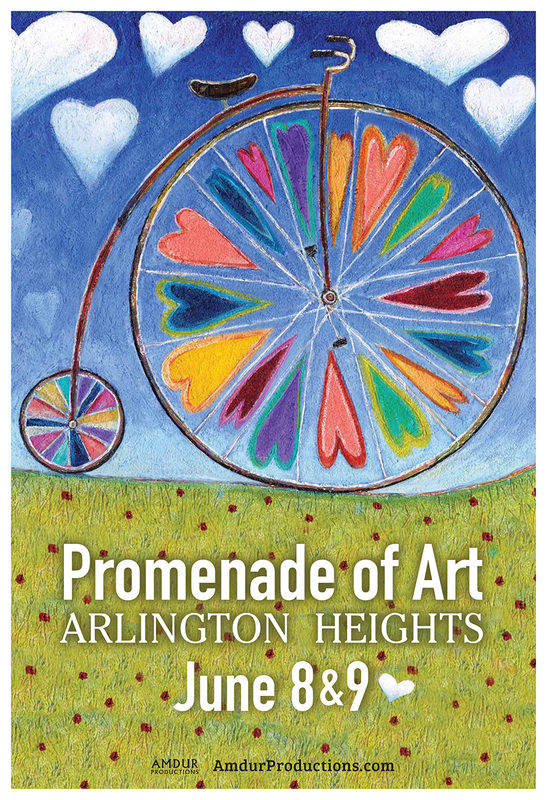 Celebrating its seventeenth year, the Promenade of Art Arlington Heights is a longstanding tradition for residents of this prosperous western Chicago suburb of over 75,000 residents and nearby communities. The festival takes place in the lively downtown area amid upscale high-rise apartments, boutiques, cafes, theaters and popular restaurants. 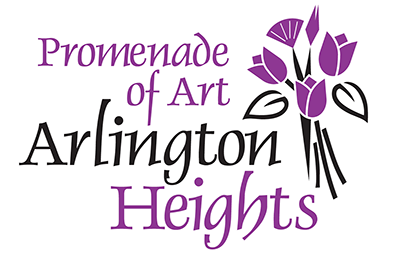 Arlington Heights is the 15th largest municipality in Illinois and a unique blend of old and new. Art of all varieties has sold well here. Many artists have been “found” by those looking for large art installations for businesses and have gone on to create special commissions for these clients. Traditional themes do well here too. The festival takes place in the beautiful downtown on closed streets and adjacent paved areas. Admission and parking at the festival are free. The Village’s five floor parking structure gives festival attendees plenty of onsite parking. Easy load in and load out make this festival a pleasure to do. Artists will have the opportunity to interact with the public through art demos and booth chats throughout the festival weekend. Fun art actvities for kids make the festival a perfect experience for all. Staff Support: Amdur Productions staff is present on site throughout the entire festival to assist artists from load in to load out. Artist Parking: Amdur Productions reserves close day and overnight parking for artists at no additional cost. Load-in: Artists will be able to drive up to or very close to their booth space and unload their vehicle. Tent Rental: Artists may rent tents, tables, pro-panels, and weights through the festival. Tents are commercial grade and rental includes delivery, set up, weights and removal. ProPanel Rental: We will have limited “pro-panel” walls available for artists. Rental is on a first come/first served basis, quantity is limited. Set Up/Take Down Help: Booth set up and take down assistance is available on a scheduled reserved time and 30 minute cost basis. Break Room: An artist break room/area provides refreshments throughout the festival for artists. 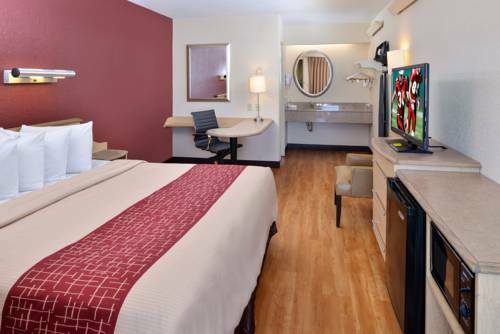 Hotel Rooms: Amdur Productions arranges discounts at local hotels and rental properties for each festival. Marketing: A large multi-layered marketing plan supports this show. Professional public relations ensure high visibility for artists and this festival. Security: Overnight security is provided. All artwork submitted to jury, displayed and presented for sale at festivals must be created, designed and made or made under the direct supervision of the accepted artist(s). All artwork shown must be for sale. An artist may apply in more than one category, but not twice in the same category. Jewelry created through fabrication and casting is allowed if the original casts are made by the artist. No commercial casts/molds or production studio work allowed. No factory produced items may be shown. Photography/Digital art: Original work made by the hands of the photographer is allowed. Only one size of an image may be hung in a booth. All printing of images must be done by the photographer or under their direct supervision. Artists must create their work from start to finish. The Artist certifies that jury images submitted represent their current original work and represent the category and body of art that will be displayed at the festival. Art collaborators (up to two artists in total) producing a single item qualify as an exhibitor. A collaborator is not an employee or helper. If artists enter as a collaboration, it must be clearly noted on the application and art shown must be signed by both. No work made solely by apprentices or employees is allowed. All artwork must be made in the country the artist resides in. “Buy/sell” items are strictly prohibited from all or part of an artist’s booth. Buy/Sell is any art or object that is purchased from a manufacturer or maker other than the artist and sold at a festival as “original” work. The restriction of buy/sell work is in ALL categories of art at ALL shows. Multiples: Limited editions of work in which the artist hand manipulates plates, stones, or screens numbered and signed in editions up to 500 are allowed and are an artist’s original body of work. Reproductions by mechanical techniques including “giclee” and “iris” prints must be signed and numbered (up to 500). Artists may display reproductions on up to 10 linear feet of their booth. Acceptance is non-transferable. Booths cannot be split. All festivals are drug-free. No smoking is allowed in or near artists’ booths. Accepted artists must be present during all festival hours. No agents, representatives, family members or friends are permitted as a substitute for the accepted artists’ attendance, unless express exception is granted in special circumstances. Any artist closing the booth prior to the end of the show without permission will not be permitted to return the next day or in future years. Only artwork in the category accepted through the jury process is allowed. It is the exclusive right of the Festival Committee to remove work that is not in compliance with festival rules. See Amdurproductions.com for full info. Discount/sales signs, and ribbons from other shows are not allowed except at The Highwood Starving Artists Show. Each exhibitor is responsible to collecting and remitting local sales tax to the State’s Department of Revenue as required by law. Fine art reproductions must be clearly and individually labeled as a limited edition which is signed and numbered on the front of each piece. The method of reproduction and brief process description must be on the back. Browse bins may be used, but reproductions may not be mixed with originals. Framed reproductions may be hung on one wall not to exceed a total of ten linear feet. No laser prints or photo copies permitted. Limited Edition Prints are printed works for which the artist hand manipulates the plates, stones or screens and which have been properly signed and numbered as a limited edition. These hand pulled prints are considered to be originals. Printmakers are encouraged to identify their process. Juried Art Services is free to participating artists and includes a detailed introductory tutorial. After reviewing our prospectus and the JAS Tutorial, if you have any questions contact us via email or phone, and we will assist you with the process of applying to our festivals. When applying in two categories, work in each must be substantially different. Four images of the work and one of the display must be submitted for each category. A separate jury fee is required for each category. Online jury payments are processed directly by Amdur Productions through a secure payment system. Email confirmation of your payment will be sent. Please follow online payment instructions if paying your jury fee with a credit card. Your jury fee payment will be posted to JAS within three days after you submit your application. All questions or concerns regarding the payment of your fees should be directed to the office at 847-926-4300 or email [email protected]. If paying with a check or money order (US currency only) please send via US mail no later than 7 days after the submission of your online application. Applications will not be processed or forwarded on to our jury unless your jury fee is paid in full. The non-refundable jury fee check will be deposited on receipt. Please note the festival name on your check. After reviewing our prospectus, if you have any questions contact us via email or phone, and we will assist you with the process of applying to our festivals. Online jury payments are processed by Zapplication. Email confirmation of your payment will be sent. Please follow online payment instructions if paying your jury fee with a credit card. All questions or concerns regarding the payment of your fees should be directed to the office at 847-926-4300 or email [email protected]. Spaces are 10’ X 10’ and work must be contained within the assigned space. You may not infringe on another space physically or audibly. Exhibitors must have a white tent. All tables must be skirted to the ground. Only one artist’s work or the work of two approved collaborating artists may be displayed per booth. Artist must keep their area clean and orderly. Double spaces are considered and must be occupied by two tents. An artist requesting a corner must either have the corner wall open or use the outside wall to display art. Special booth space and special needs requests will be accepted but are not guaranteed. We will make every effort to meet all special requests on a first come, first served basis. Additional charges may apply. Please include all booth requests on the registration form. During the festival, all exhibits will be visited by a festival representative to ensure that they are in compliance with our festival policies. It is the exclusive right and responsibility of the Festival Staff to call for the removal of work that is not in compliance with the festival policies and requirements. Non-compliance may result in expulsion from the festival or refusal of future festival participation. All canopies are required to be white and able to withstand winds and rain and be properly weighted. Properly weighting requires AT LEAST 40 pounds per leg (more in windy weather). Tents must be connected to weights with rope or straps, not bungee cords. Weights may not include cinderblocks or water jugs as they do not meet the 40 pound requirement. Once the jury process is complete, all artists will receive an email from Juried Art Services directing the artist to log into their JAS account to check the status of their application. Please keep your email up to date with JAS to receive this information in a timely manner. Accepted artists will be required to submit their booth fee payment by March 8, 2019 for participation. If the booth fee is not received by the deadline date, the artist may forfeit his/her participation in the festival. Credit card payments are processed directly by Amdur Productions. All questions or concerns regarding the payment of your fees should be directed to Annette in our accounting office at 847-926-4300. If paying with a check or money order (US Currency only) please send via US mail no later than 15 days after the registration due date (03/8/2019). Include artist’s name and name of festival on your check. If you have any questions regarding status notification or our payment process please contact us. Once the jury process is complete, all artists will receive an email from Zapplication with their status (invited, wait list, or decline). All artists who have applied will be notified on February 8, 2019 via email. Invited artists will be required to submit their booth fee payment by March 8, 2019 for participation. If the booth fee is not received by the deadline date, the artist may forfeit his/her participation in the festival. 2D – Original two-dimensional work including graphite, charcoal, chalk, pastels, wax crayon, inks, and washes. All work must be framed and/or presented in a finished format. 2D Artists must show work vertically in your booth. Matted work must be shown in bins only. 3D Functional – Dimensional work that has a function – such as wearable fiber or wood furniture. Painting – Original, two-dimensional work created with pigment, including oils, acrylics, watercolor, egg tempura, etc. Photography – Signed prints created by the artist from his/her own original negative or digital files that have been “taken” and processed by that artist or under the artist’s direct supervision. Jewelry – No buy/sell or buy/sell fill-in allowed. Fiber – Original work created by the artist from fibers/fabric or leather including batik, basketry, weaving, and quilt-making. No factory produced items are permitted. Furniture – Original work in any material which is functional as a piece of functional furniture or home accessory. Glass – Original work created in glass by the artist including blown glass, fused glass or stained glass. Print Making – Prints manually created by the artist using plates, stones or screens which have been signed and numbered. Metal – Original work created by the artist without use of a production studio. Mixed Media – Includes collage and handmade paper; incorporates more than one type of material. Generally flat, wall hung art. Wood – Original hand-tooled, machine worked, built-up, turned or carved work in wood. An Artist Statement describing the technique, materials, and processes used in the creation of your entire body of work must be included with each Juried Art Services entry. Co-artists must describe the collaboration. Your Artist Statement may be used in the promotion of the festival through public relations efforts and should be no longer than a maximum of 1000 characters (including punctuation and spacing). A wait list is selected from the jury’s scores in each category, and wait listed artists are invited as cancellations occur in that particular category. Wait list artists can be accepted up to and on the day of the show and will be notified by phone and email when a booth becomes available. If an artist cancels a show on or before April 8, 2019, they will be given a refund for the amount they have paid towards the booth, less $50 processing fee. 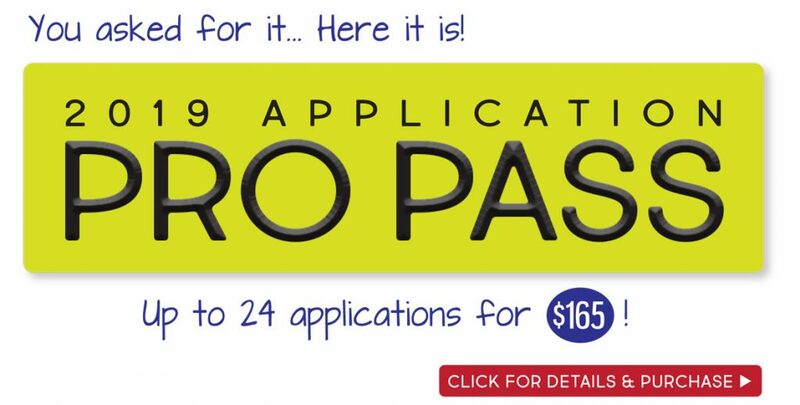 Application fees and permit fees are non-refundable. No refunds after April 8, 2019. Artists that cancel after April 8, 2019 can have the amount that they have paid toward their booth fee transferred to another 2019 Amdur Productions’ festival balance. The fee to transfer is $125. Permit fees and application fees are non-transferable between festivals. Artists who have not checked in and/or notified Amdur Productions with a message via festival phone (224-253-2330), office phone (847-926-4300), or email ([email protected]) by 7:30 am on the first day of festival, will be considered a NO SHOW and the assigned space will be forfeited with no refund. By applying to this festival, I hereby certify that these images represent my original work, and that the work is unique and made by me. I also agree to follow all festival rules as outlined in the prospectus. In partnership situations, we declare that our combined efforts made every individual piece of work we would exhibit, if accepted. I/We also agree to allow images of my/our work to be used in publicity and or materials.